There is an entire section of the internet that you probably don’t see on a daily basis, it’s called the “darknet.” Unlike the regular web, the darknet is made up of websites–many of them specialize in taboo or illegal subjects–that can only be accessed via The Onion Router (TOR). Until now, getting around the darknet has been difficult, particularly if you are searching for guns, drugs, passports, etc. Since there are many marketplaces, and new ones are popping up all the time, it isn’t always easy to check each site one at a time in order to find a good deal. Well, a new search engine, Grams, is fixing all of that. The actual search engine itself is not necessarily reminiscent of Google’s current design, but it does include some of that site’s features, like the “I’m Feeling Lucky” button. 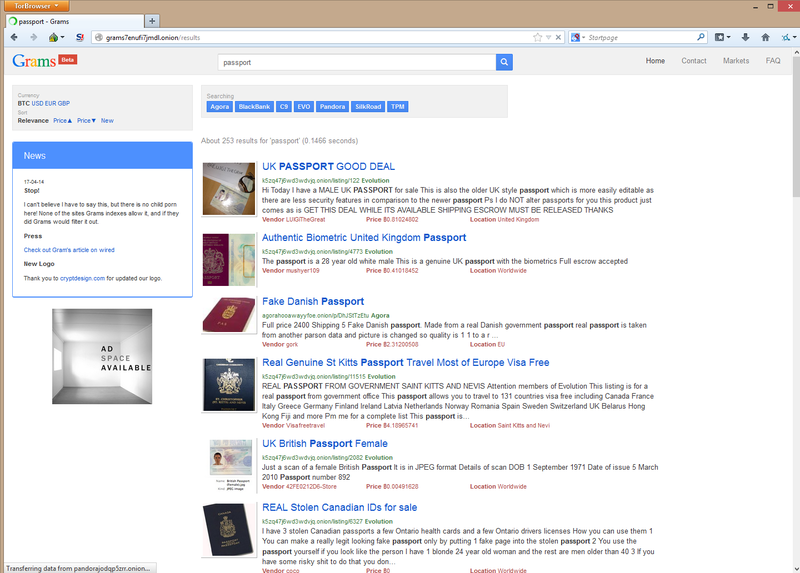 Once you figure out what you would like to buy, you can enter the keywords into the search bar. Much like Google, Grams lets you know how many results there are and how fast it was able to retrieve all of them. Unlike a lot of the other darknet sites, Grams is particularly speedy, which should make users quite pleased. Since Grams is all about the darknet marketplaces, you are able to filter out results from any of the ones that don’t interest you. 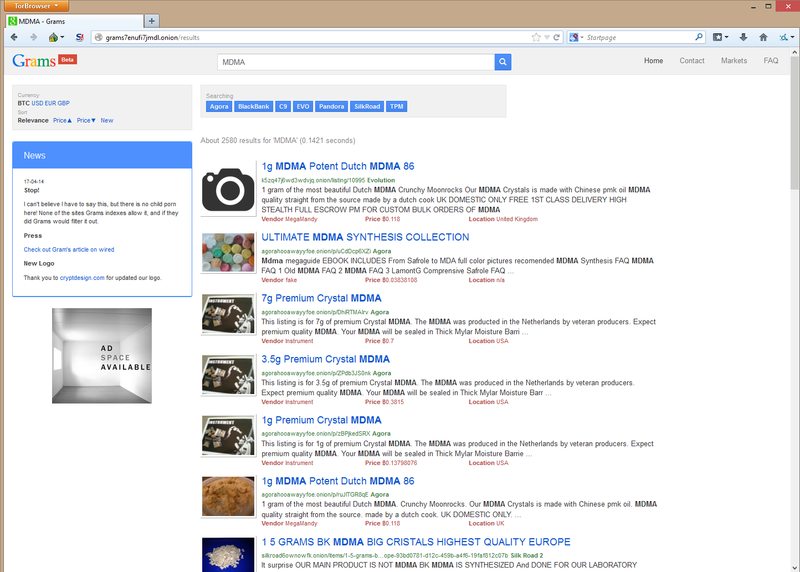 For example, if you would only like to search Agora, Pandora, and the new Silk Road, Grams lets you do that. By default, Grams includes the Bitcoin price of each item that is pulled up with a search. However, to make things easier, you can switch all of the results to USD, EUR, or GBP. This is a feature that some of the marketplaces themselves don’t even have, but it’s definitely a better option that remembering the latest Bitcoin conversion rate at all times. The last main set of filters on the search engine are for Price and Recency. 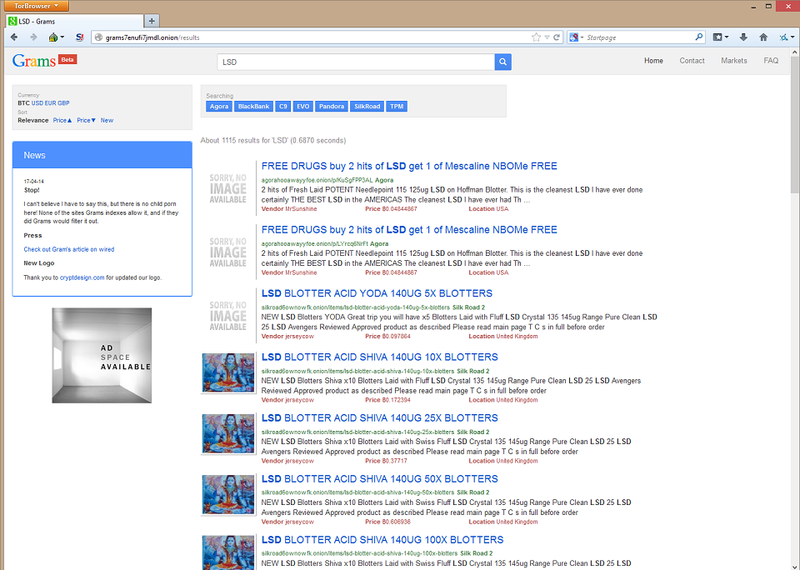 So, if you’d like to see all of the cheapest MDMA (Molly) listings up top, you can do that. Filters are neat, but the search results themselves provide all of the crucial product information and prevent searchers from even having to click on a link to find things out. For example, each result includes a picture of the item, the vendor’s username, the marketplace, price, and shipping location. Guns are undoubtedly bad (when purchased illegally) and it can be argued whether drugs are bad as well. However, neither of those things make Grams a revolting site to visit, and its creator wants things to stay that way. Since the search engine is built to scan through marketplaces, some of the horrific stuff on the darknet is not indexed. Therefore, if you do happen to visit Grams, you don’t need to do so with your cursor hovering over the “close” button. As of writing, there is a placeholder where an ad would be located. Buying illegal guns or drugs is illegal. Everyone knows that, but it isn’t stopping thousands of people from using the online marketplaces to place orders. What Grams is doing isn’t necessarily illegal, though it will definitely facilitate numerous crimes. Since all of the marketplaces use Bitcoin as their one and only currency, law enforcement really don’t have a way to combat the TOR-based sites. The marketplaces cannot be shutdown, or at least it is much more difficult than shutting down a site on the regular internet. Plus, the transactions are relatively private and secure, since Bitcoin isn’t monitored in the same way as banks are. 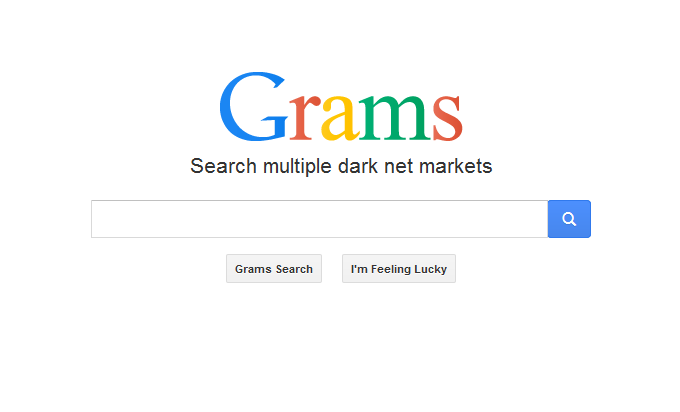 Therefore, darknet marketplaces aren’t going anywhere soon, and Grams has just made using it a whole lot easier to search through them. 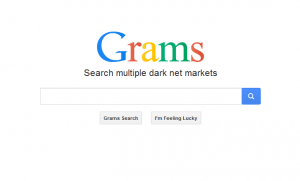 Question – If you use the darknet marketplaces, will you start using Grams? 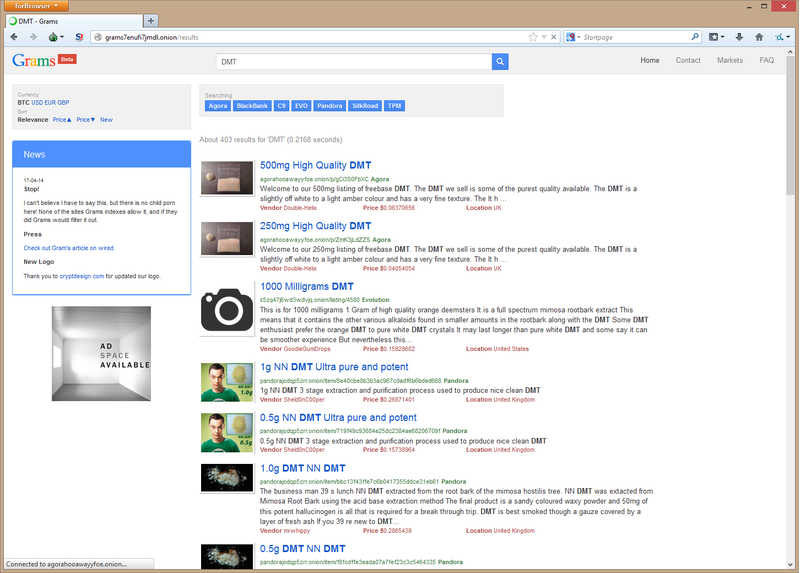 Summary: A search engine for darknet marketplaces has launched. 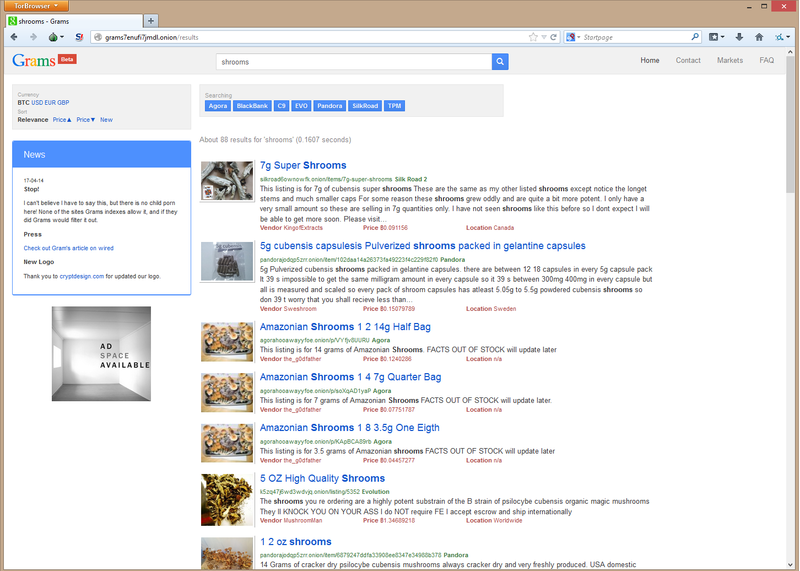 The site, called Grams, has some features that are similar to those found on Google.